Edwardian Hotels London has won the Gold Award for Best Multi-Channel Customer Service at the European Contact Centre & Customer Service Awards 2016 (ECCCSA 2016) for its technological innovation in guest communications. The award recognises the business’ successful deployment of a multi-contact strategy for their Artificial Intelligence application, Edward, as well as their web-based online check-in and check-out system, which enable guests to communicate directly with the business through an online platform. Launched in May 2016, the artificially intelligent service called ‘Edward’ is designed to deliver exceptional experiences for guests who prefer digital brand interaction. 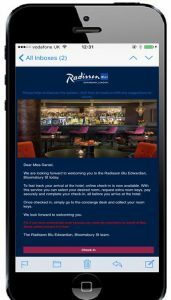 The new Interactive SMS service allows guests to check and request hotel amenities – such as towels or room service, get information about local bars and restaurants and even express complaints – simply by sending a text message. ‘Edward’ will respond within a few seconds. Additionally, Edwardian Hotels London’s web and mobile based check-in and check-out, launched in September 2016, gives guests a fast and convenient check in and check out process allowing them to check in up to three days prior to arrival, check out online and receive their invoice via email. On check-in, guests can choose preferences such as room type, proximity to the lift, a specific floor, specific room number and request in-room amenities. The programme is easy for guests to navigate, without having to download an app that takes up time and space on mobile devices. Michael Mrini, director of Information Technology at Edwardian Hotels London, said: “This award is a great accolade for Edwardian Hotels London and testament to our constant endeavour in improving the service our guests receive when they stay with us. It enables them to communicate with us on their choice of platform.